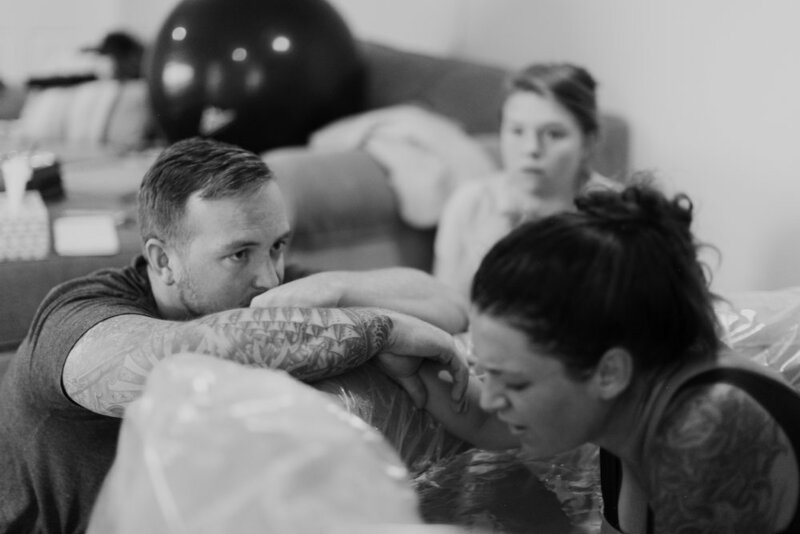 Below are some photos from our home birth with sweet baby Pearl. A lot of the images are cropped towards the end but man, having these photos is something I will treasure for the rest of my life. Not only did they help me process our Birth but seeing your own baby literally come out of you is the most incredible thing. Every time I look through these photos I am filled with such strength and joy. 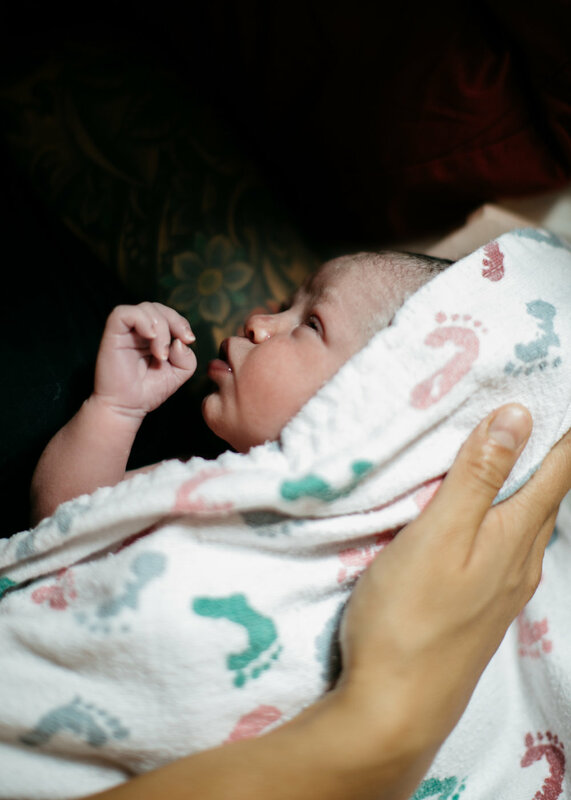 This post is a pretty raw and vulnerable one so if birth stories aren't for you I'd skip it! The biggest lesson I learned about Pearls birth is that EVERY birth is different. 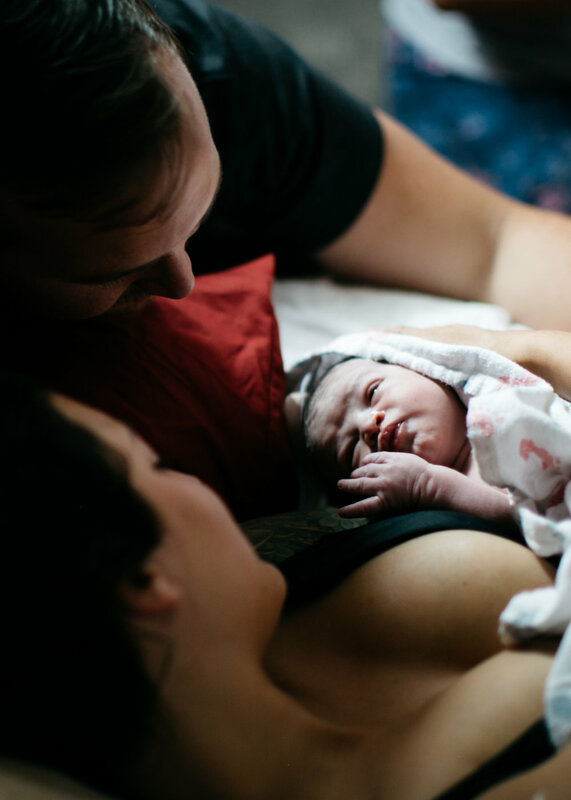 If you want to read Olives Birth story its HERE... but quick spark notes... I was supposed to have a homebirth with Olive and ended up getting pre-eclampsia and had to last minute transfer to a new midwife who delivers in the hospital. I was induced without the use of Pitocin and Olive arrived within 8 hours. At the time it was my biggest fear but ended up being so insanely beautiful. I felt like heaven was in the room, I felt the presence of Jesus more than I ever have before and I met my hero Jolene my midwife... who I can not speak more highly of. Fast forward to Jolene switching and doing homebirths and we were excited to try to birth at home with Pearl. We were thankful when we made it to 36 weeks (farther than I got with Olive) and excited for baby to come. Pearl ended up coming a few days before her due date and I didn't believe I was actually in labor until I was dilated to a 10 even though you can see in the photos below, I was clearly in labor and in complete denial. I started having contractions around 3 in the morning but dismissed them because I had been having contractions for what felt like the entire month of September. 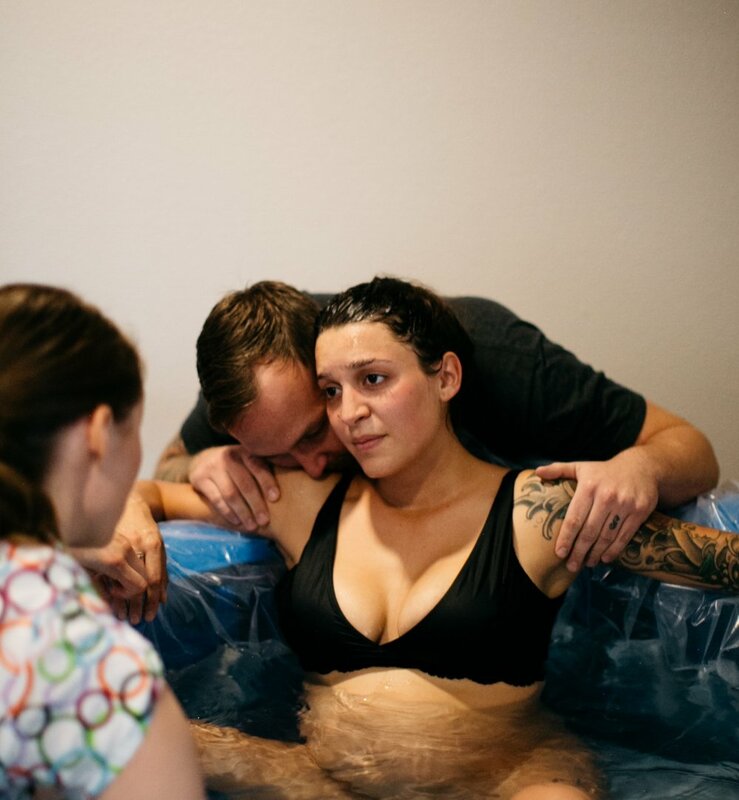 I ended up texting my doula to just let her know that I was having them 6 minutes apart but that "they surely meant nothing and that I wasn't in labor" an hour passed and they were 3 -5 minutes apart so I decided to just text my midwife to let her know... which she responded with start filling up the birth tub and get ready. Austin and I were both like NO WAY, this is crazy... I'm not in labor. My doula ended up coming over shortly after I texted Jolene and Jolene and her team arrived around 7 am. In the photos above I was in transition and the contractions were strong but as soon as they passed we would talk and laugh about random things. Then a contraction would come again, I would breathe through them and then we would go back to talking. They were definitely getting stronger and longer but to me, this whole experience felt SO weird. With Olive's I was in the zone and with Pearl I was in and out of "the zone". 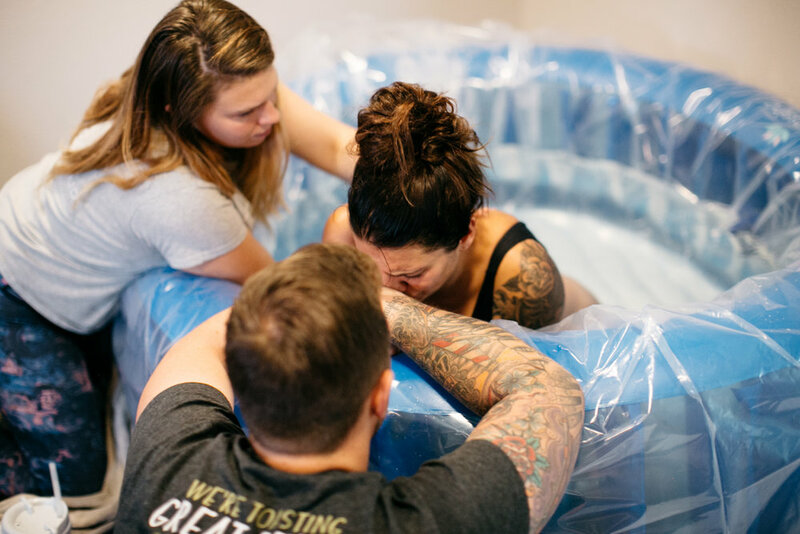 My doula Hannah kept reminding me to let go of any expectations and to just be, but I was so weirded out by being okay in between contractions I was convincing myself that I wasn't in labor and that my birth team was going to leave and come back later when I was in "actual labor". Some time had passed and I had some intense contractions and was starting to push my way through them, which then Jolene came and asked if I wanted to be checked and I was at a 10. I pushed a few more times in the tub but my water hadn't broken yet so they told me to go sit in the toilet and see if my water would break. Within one contraction my water broke and scared the daylights out of me (just like when it did with Olive) I was crying because I was so scared when it broke but then I got back in the tub and continued to try to push. This is when I had the hardest time. I wanted the music off, candles blown out and light off. I felt like I was losing control and couldn't get on top of pushing in the tub. I kept trying and tried a few different positions but nothing I was doing was comfortable and I was starting to lose myself. Looking back, this was my biggest struggle with my labor. I had this huge expectation of it being so insanely peaceful and calm and I was the opposite of that. I was upset and frustrated and I decided I wasn't going to push her out. In the photos above I'm talking with Jolene telling her I cant and don't want to do it and I'd like to be done. Everyone was amazing and encouraging and making sure I was supported but inside I just wasn't ready. I went from thinking (lying to myself) I wasn't in labor to being at 10 and ready to push... that in my mind it happened too fast and I wasn't ready! I fought it for a while, and talked it out with Jolene, where she kept encouraging me if I would push, she would come out and I could be done. I kept saying this is SO hard and that I just didn't want to do it anymore and that was really hard for me to admit. But I also think it was really healthy for me to process through it because labor is beautiful but labor is hard work! I had to realize that just because it was hard didn't mean that Jesus wasn't there with me through every contraction. After I felt like I couldn't get on top of it, we decided to move to the bed. This is where I decided I still needed more time and I started holding my contractions in and refusing to push. Which I know sounds so odd, I didn't even think that was possible. But I think Jesus knew I needed a break and gave me the grace to let the contractions pass. After a little while, I started pushing again and Jolene talked me through doing slow pushes which helped so much. Within a few pushes, Pearl came rushing out to join us! AND if you hadn't noticed yet, Austin is smiling in every single photo which totally makes me cry every time I look through these photos. Pearl was out and here and we were flooded with Joy. She made sure everyone knew she was here and then went to being her insanely peaceful self and nursed for what felt like the next 2 hours straight. There's so much more to share but not the right words to write. It took me a while to process Pearls birth but really helped me learn to let go, and let God. I was recently at a community dinner where I met a new super sweet friend. I was sharing a bit of my experience with my homebirth and was saying how it was different from the first and how I was expecting this and that and lots of peace and she said something that spoke directly to my heart and any insecurity that surrounds this birth. She said "Pearl was your Peace coming to you" and it just struck a chord in my heart... because of that's so true. The atmosphere in my home may not have been everything I dreamt it up to be but Pearl sure is everything I dreamt her up to be. She is our PEACE. Literally, since she joined us she has been so insanely peaceful, like a breath of fresh air. I was laboring for my peace it was exactly what I needed to hear, from a complete stranger. I'm proud of myself and proud of our story. I can't begin to explain how incredible my entire birth team was. I will have to have all my babies wherever Jolene is. She brings such a peace and strength with her and makes you feel like a super women. She truely loves her job and it is seen in everything she does. Hannah my doula knows all the tips to help with labor and is my spirtual rock! 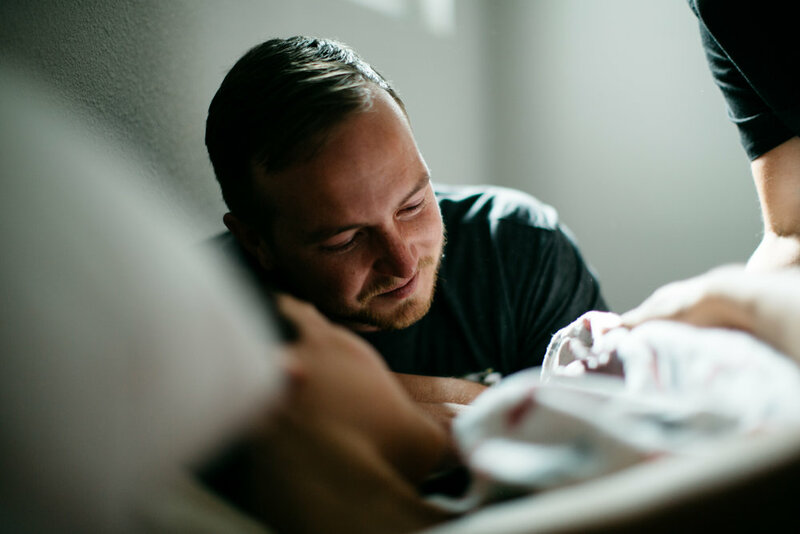 My super supportive husband who was everything I needed him to be and my photographer karen who captured Pearls birth in the most magical way that im forever grateful for.